NATO member states must do more to meet the measures agreed at last year’s Welsh summit to tackle the perceived threat of Russian aggression, a group of MPs has warned. A report from the Select Defense Committee said while measures had been agreed upon, more time and resources need to be committed to NATO forces to ensure they have the capacity to meet potential Russian threats. The report, “Re-thinking defense to meet new threats,” also acknowledged the UK faces considerable danger from states dominated by radical jihadist groups. The proposed “reassurance measures,” intended to make NATO allies feel safer, were accepted at the NATO summit in Wales and include positioning equipment in the Baltic States, continuous presence of NATO troops on training in the Baltic, and the re-establishment of large-scale military exercises. A further commitment to create a rapid response team (Very High Joint Task Force – VJTF) was accepted. MPs are now concerned, however, that the UK and its allies will not be able to assemble troops at anywhere near the rate of the Russian army. The MPs said the VJTF, which aims to build the capacity to deploy 5,500 troops at 48 hours’ notice, would not be ready until 2016. Russia can currently deploy 150,000 troops at 72 hours’ notice. The report also said the current scope of NATO military exercises “still fall far short” of the scale of recent Russian exercises. NATO has already increased its military presence in the Baltic States, with squadrons of fighter jets present as a show of force and as a strategic tripwire to reassure allies. 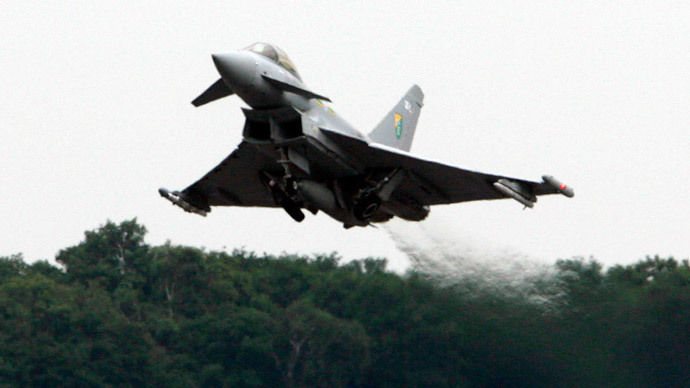 Its Baltic Air Policing Mission intercepted 150 incursions into NATO airspace by Russian aircraft last year. The US is normally responsible for roughly 70 percent of NATO’s military capability, the report notes, but they are currently looking to their European allies to take the lead on the defensive strategy. MPs said in order to increase the scope of NATO operations, it is imperative the UK maintain its pledge to spend 2 percent of gross domestic product (GDP) on defense spending. Prime Minister David Cameron previously said the target would be met for the next two years, but has failed to commit beyond 2016. “We are spending at the NATO target of 2 percent this year and we will go on spending 2 percent next year. That is the spending review period that takes us right up to the end of March 2016. I cannot forecast for you where the percentage will land beyond that,” he said. The report adds that, “The US has made it clear that it perceives the UK's commitment as the lynchpin of the broader NATO commitment to increase defense spending. And, therefore, if the UK were to reduce expenditure, it would undermine the alliance as a whole. “We are concerned that, should defense spending in the UK fall below the NATO target of 2 percent of GDP in 2016-17, the impact on the UK's credibility as a military ally would be extremely damaging, particularly in the eyes of the US and our European partners. It would damage UK leadership in NATO and Putin's Russia will be looking very carefully for signs of weakness in NATO,” it stated.